M173 | 979 m. | 3212 ft.
We started the first hike of 2016 basically from the Cluanie Inn where we had spent the night. The day before we had arrived in Scotland at Edinburghís Turnhouse Airport and had driven up to Loch Cluanie in a leisurely fashion. Having arrived early enough meant we could even take a pint at a picnic table in front of the Inn before lunch. A relaxed start to the “nine days nine hikes”-holiday. We started the climb of A’Chralaig from the parking on the north side of the A 87 which is close to the bridge over the Allt a’Chaorainn Mhoir. A few metres on the public footpath to Alltbeithe Youth Hospital in Glen Affric were enough: We immediately found the small cairn that marks the path leading up to the southeast ridge of A’Chralaig. This path climbed steeply beside a burn up to the high ridge above. The going was easy enough, the ground being relatively dry. Steadily we climbed along the burn. Once on the ridge proper the terrain became more and more stony. Much of the ascent was spent in clouds and fog but very occasionally views of Loch Cluanie, Am Bathach and (higher up on the ridge) of the Munros further to the east could be had. Then, after some considerable exertion at least on my part, the *massive* cairn of A’Chralaig came into view. Visions of my first climb of this Munro almost 20 years ago in late December 1998 sprang up from my memory. It had been a snowy and icy affair which I only managed to complete thanks to a pair of crampons I had packed. That had been my first solo Munro and my first solo Munro in winter at the same time! We faced no such challenges this day. After five minutes at the summit (no views) we continued along the ridge towards Stob Choire na Chralaig. The ridge was very well-defined and some nice and narrow sections requiring very moderate hand work were fun. Then we descended from Stob Choire na Chralaig towards Mullach Fraoch-choire. Unfortunately we could see nothing much of the great pinnacles and the sharp ridge leading to the summit. But let me assure you that even without views this part of the climb was definitely real fun and the scrambling on and the exposure of the path bypassing the pinnacles was enough to raise our adrenalin levels. When the pinnacles were behind us the final rise towards the summit of the Mullach was straightforward. This second Munro of the day was well-earned indeed. At the summit we rested a bit and then decided to split up our party of two. Frank would head for Ciste Dubh in order to bag that Munro, which I already had in my kitty since I had climbed it in 2000 with Mike. I would follow him as far as the An Caorann Mor and then return along that glen to the car, where I would wait for him. So Frank headed of, retraced our steps along the path of ascent and disappeared into the mist. I hung around for a few more minutes and then followed him towards the col between the Mullach and Stob Choire na Chralaig. A few minutes before I reached the col I met two other hikers who informed me that Frank had picked up my Leki pole which I had lost during the ascent. Great! From the col it was first a steep descent on loose scree into the corrie bowl, then an almost level traverse of a snow field and then a long pathless descent down the grassy slope of the hill (Coire Odhar). This wide corrie boasts a few rivulets which become burns and cut deeply into the hillside. So at one point I was forced to descend very steeply into the grassy cut formed by a burn and to follow it until it opened again onto flatter terrain. This excursion into a “ravine” could probably have been avoided had the visibility been better but in the mist orientation was difficult. Then the clag lifted and I could see An Caorann Mor below. From this point onward things became easy. I hit the path in the glen, turned south and hiked back the four or five kilometres to our car. Frank on the other hand had had to climb the extremely steep eastern flank of Ciste Dubh which he managed with considerable effort. From the summit he descended to the Bealach a’Choinnich which is very confusing in mist since three ridges end there. In order to gain the path west of Am Bathach that leads to Loch Cluanie you even have to climb a bit from the bealach. Very confounding. From the bealach Frank followed the path until it reached the plantation close by the Cluanie Inn. I picked him up some 90 minutes after I had reached the car. We drank some cans of Coca Cola which I had bought at the Inn, changed into less damp clothes and headed off towards Inver Roy where our warm and cosy chalet waited for us. This hike was not for the faint-hearted since the weather was not too good. There were hardly any views and there was quite some exposure on Mullach Fraoch-choire and Ciste Dubh (for Frank). It was wet and windy. But we completed the round of these hills without major problems and I was delighted to finally climb the pinnacle ridge of Mullach Fraoch-choire and to see the great cairn of A’Chralaig again. Description Ciste Dhubh rises 5 kilometres north of the west end of Loch Cluanie. It is a pointed peak, partly hidden behind the lower ridge of Am Bathach, but the summit can just be seen, its south face split by two or three steep gullies. The south ridge of the mountain rises steeply above the Bealach a' Choinich and continues as a narrow level arete for several hundred metres before the final rise to the summit. On the north side three short steep ridges drop down towards Glen Affric, but they should be treated with caution, particularly in winter if snow conditions are unstable.The ascent starts a few hundred metres east of Cluanie Inn along a path on the east side of the Allt a' Chaorainn Bhig. Follow this stream to its source at the Bealach a' Choinich. 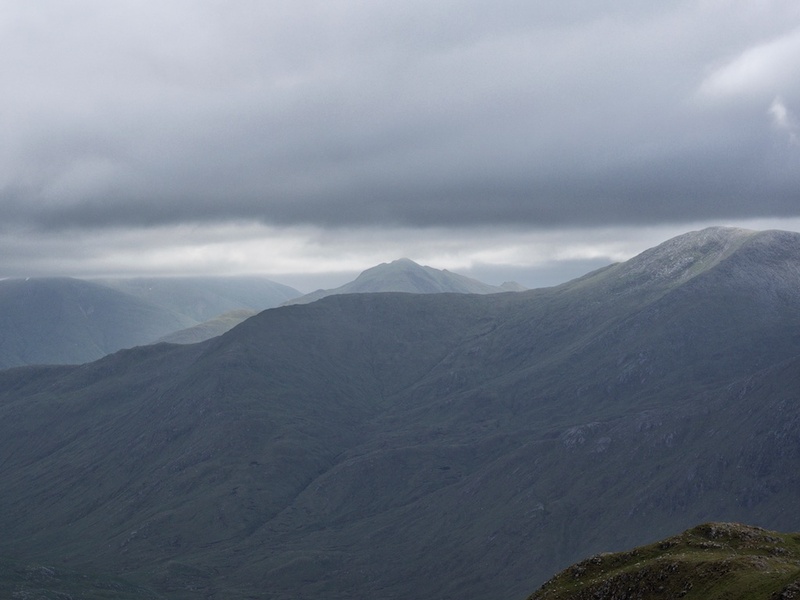 An alternative route to this point is along the fine narrow ridge of Am Bathach. From the bealach, climb steeply north to the narrow level south ridge and follow it to the final rise to the summit of Ciste Dhubh.